Note: This is a reproduction of our published version of this information. Please know that format was compromised in the transfer of this data to the web. We decided it was more important to make it available and not worry about how "pretty" it is. This should still be available in book form from Janet Flickinger (link on our home page) or from AHSGR. Please use your Edit > Find function to search for surnames and do try every possible variant spelling. 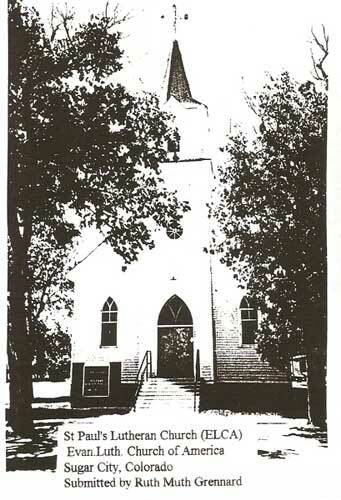 This publication contains the records of the St. Paul's German Evangelical Lutheran Church of Rocky Ford, Colorado transcribed from the original German. The records begin with the signatures of congregation members with some notes and include the Church registers for christenings, confirmations, marriages, and deaths, as well as the general membership register. Every effort was made to achieve accuracy in the extraction and computer entry of the data in this volume. No attempt was made to make corrections unless noted. The General Register did group some individuals into families and those groupings are seen here. No attempt was made to link other individuals. Individual data is presented as it was recorded originally. However, we present the data to you in alphabetical order to assist you in locating your surnames of interest. Please remember that records were kept by different persons and spellings of names varied because of this. Several years ago the late Molly Schafer Miley spent many hours transcribing much of this information from the original Church records. Her daughter, Betty Miley Ashley kept Molly's data for safe-keeping and has graciously shared the transcribed portion of the records. More recently Ruth Muth Grenard obtained a copy of the original records and generously bestowed them upon Jeruslan Nachrichten and the Village Research Projects for the Wiesenseite daughter colonies Wiesenmueller and Gnadenthau. Entitled to vote May 1910. LINE 1: George Schafer first appeared in the records in the membership register in 1911 LINES 2, 3, 4 : This same record gave his birthdate & place, baptism date & place, and noted that he was entitled to vote May 1910. LINE 5: Katharina Elisabeth Schafer first appeared in the records in the membership register in 1911 with her husband George and their children [beginning with Friedrich]. LINES 6 & 7: This same record gives Katharina's birthdate & place and states that her maiden name was Muller. LINE 8: Katherina next appeared in the Death Register for 1944-1963. LINES 9 - 14: This is the death and burial information for Katherina. LINE 15: Friedrich is the first child of this couple as listed in the general membership register 1911. You will find some individuals in family groupings (such as in the above example). These are taken from the general membership register and appear as recorded in the original register. We have made no attempt to create family groupings from other individual records. In researching a surname, all possible variant spellings should be considered. St. Paul's German Evangelical Lutheran Church of Rocky Ford, Colorado was founded when 39 families of German Russian immigrants decided, in 1910, to purchase some land on which to build their church building from George Darling. Darling was related to Senator George Swink, founder of Rocky Ford, Colorado. This land was part of a larger parcel obtained from the United States Government by way of a patent to Senator Swink. The German Russian group was headed by Reverend Gustav Wiencke, who was the head of the parent board of the local church group which was incorporated in 1911. The membership of this church of German Russian immigrants was enticed to the Rocky Ford area by the American Crystal Sugar company to work in the sugar beet industry as field laborers. Many of these immigrants were first brought into the area by way of railroad boxcars to the Sugar City, Colorado area (about 25 miles from Rocky Ford) and, after living for awhile in a tent city in that area, were transported to Rocky Ford for the beet labor. St. Paul's founders actually began work on the church building in 1910 with members of the church donating their labor. By sometime in 1912 the building was completed and work was then begun on the adjacent house which was constructed as the church parsonage. Originally this congregation was a part of the German Evangelical Lutheran Immanuel Congregation Church of Rocky Ford, but a split occurred in the congregation in May of 1910. What was to become the St. Paul's congregation began meeting at the old Park Hotel in Rocky Ford. Between 1915 and 1916 the congregation split again when about half of the original 39 families moved to an area east of La Junta, Colorado (about 25 miles away from Rocky Ford) and established churches there. Over the years the membership of this congregation dwindled and the last services of the German Russian descendants were held there sometime in the 1970's. Another congregation then held services in the building for some time. According to a Rocky Ford Daily Gazette newspaper article dated 14 June 1974, at that time only two of the original St. Paul's Board members were still living: Fritz Elsesser and George Brick. Other original Board members were: Fritz Freidenberger, Michael Will, Jacob Bender, Henry Elsesser, and Henry Abert. Ministers who served full time over the years include: Reverends L. Hopp, George Juttner, Bahr, George Gersib, Fred Loeffler, W. Siffring, and William Bodamer. According to a letter from Dorothy Freidenberger Winger dated 1980, Charter member surnames include: Schafer, Freidenberger, Wunch, Schwein, Diel, Abert, Dahmer, Elsesser, Will, Bender, Yekel, Engleman, and Kindsvater. I am the granddaughter of Georg Peter Muth and his wife Katherina Elizabeth Schwab. The Muths were from Wiesenmueller and were early members of St. Paul's. In 1984, I bought the property and restored both the church building and the parsonage. I sold these properties in 1989. However, records were reproduced from the originals of the Articles of Incorporation, as well as the records for membership, christenings, deaths, marriages, and confirmation classes. These records are in my possession. The records from the general, christening, confirmation, marriage, and death registers in alphabetical order. Born 25 May 1911 Rocky Ford, CO.
Christened by Gustav K. WIENCKE. Godparents: Andreas KINDSVATER & wife, Jacob HEDINGER & wife. Born 24 June 1911 Rocky Ford, CO.
Born 14 Oct 1880 Chutor Baboff, Russia. Born 8 Aug 1881 Walter, Russia. Born 24 Dec 1905 Sugar City, CO.
DORSCH, Bertha CHR Register 1911-1913. Born 18 July 1911 Rocky Ford, CO.
Katherine FREUDENBERGER, J. MEIER, M. SCHWIEN, FREUDENBERGER, A. BUSH. Katherine FREUDENBERGER, J. MEIER, M. SCHWIEN, FREUDENBERGER, A BUSH. Born 6 Jan 1884 Oleschna (Dietal), Russia. Born 27 Oct 1881 Oleschna (Dietal), Russia. Born 11 Nov 1904 Oleschna (Dietal), Russia. Born 27 Oct 1909 Oleschna (Dietal), Russia. Born 14 Dec 1910 Rocky Ford, CO.
"Verzogen Russland nach (Kansas) 1914"
Born 4 July 1889 Oleschna (Dietal), Russia. Born 17 Oct 1909 Oleschna (Dietal), Russia. Born 20 Dec 1912 Rocky Ford, CO.
Born 7 Aug 1888 Tarlyk (Laub), Russia. Born 18 July 1909 South America. Born 17 Jan 1911 Rocky Ford, CO.
Born Jan 1912 Rocky Ford, CO.
Born 28 Oct 1880 Wiesenmuller, Russia. Entitled to vote 9 Feb 1913. Born 18 Nov 1883 Wiesenmuller, Russia. Born 15 Sep 1904 Wiesenmuller, Russia. Born 24 Oct 1906 Wiesenmuller, Russia. Born 13 Dec 1911 Wiesenmuller, Russia. Born 10 Feb 1873 Wiesenmuller, Russia. Baptism 13 Aug 1895 Wiesenmuller, Russia. Born 10 Oct 1871 Wiesenmuller. Born 20 Feb 1895 Wiesenmuller, Russia. Born 30 Jan 1899 Wiesenmuller, Russia. Baptism 7 Feb 1899 Wiesenmuller, Russia. Born 28 Jan 1903 Wiesenmuller, Russia. Baptism 2 Feb 1903 in Wiesenmuller, Russia. Born 7 July 1905 Wiesenmuller, Russia. Baptism 21 Aug 1905 Wiesenmuller, Russia. Born 24 Jan 1908 Otis, KS. Born 1 Feb 1910 Rocky Ford, CO.
Born 27 Nov 1869 Wiesenmuller, Russia. Born 7 Oct 1898 Wiesenmuller, Russia. Baptism 25 Oct 1898 Wiesenmuller, Russia. Born 3 Apr 1900 Wiesenmuller, Russia. Baptism 10 Apr 1900 Wiesenmuller, Russia. Born 4 Mar 1903 Otis, KS. Born 28 Aug 1904 Otis, KS. Born 25 Dec 1906 Otis, KS. Margarete Louise CHR Register 1913. Born 31 Dec 1911 Rocky Ford, CO.
Godparents: John BLUM & wife Amalie, John FOSS & wife Dalia. Born 29 Aug 1911 Olney Springs, CO.
Born 10 Sep 1909 Olney Springs, CO.
Born 15 Oct 1902 Rocky Ford, CO.
Born 23 Jan 1904 Rocky Ford, CO.
Born 21 Mar 1905 Rocky Ford, CO.
Born 23 Aug 1906 Rocky Ford, CO.
Born 15 Dec 1907 Rocky Ford, CO.
Born 31 Jan 1909 Rocky Ford, CO.
Born 23 Jan 1892 Jablonowka (Lauwe), Russia. Born 3 Mar 1893 Wiesenmuller, Russia. Baptism 29 Mar 1893 Wiesenmuller, Russia. Born 22 Feb 1911 Rocky Ford, CO.
Godparents: Fritz FREUDENBERGER, Friedrich SCHAFER, Amalie SCHWIEN, Elisabeth EBERT. WILL, Maria CHR Register 1911-1913. Born 24 Nov 1911 Rocky Ford, CO.